A popular brand of pink wafer is under threat after a company went into administration following a "sharp fall" in the value of sterling after Brexit. Administrator FRP Advisory said a "sustained deterioration" since the EU vote had exacerbated Rivington Biscuits in Wigan's financial difficulties. 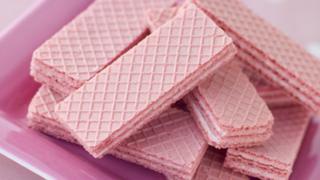 The company, which makes Pink Panther wafers, will cut 99 of its 123 staff, keeping 24 while it seeks a buyer. The administrators said the firm would "fulfil orders into the New Year". Rivington Biscuits, which trades from Ormside Close in Hindley Green, Wigan, is owned by Dutch company Van Delft. A FRP Advisory spokeswoman said over the past year, the biscuit makers had "experienced particularly challenging trading conditions" and been "left with no viable alternative other than to seek the protection of administration". "The problems were compounded by the sharp decline in the value of the pound against the euro," she said. The pound fell dramatically after the Brexit vote at the end of June, hitting a three-year low against the euro in October. This change increased costs for ingredients which Rivington Biscuits import from Europe and escalated their monthly costs, an FRP Advisory spokesman said. Russell Cash, partner at FRP Advisory, said the business was left "facing unsustainable cash-flow pressure" after "a sustained deterioration in trading conditions and significant additional pricing costs since the summer". "As administrators, given the financial situation, we have had to take the difficult decision of making a large number of redundancies and our immediate priority is to assist those staff who have lost their job to make timely claims," he added.